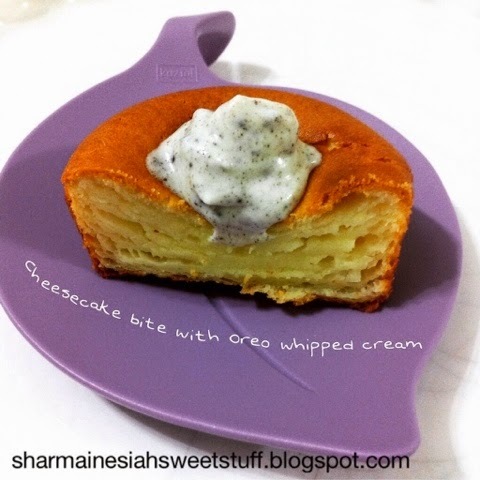 Cheesecake is a dessert that sounds really troublesome and hard to make but here is one simple and easy-to-follow cheesecake recipe that leads you to love cheesecakes more than you already do. The cheesecake bites that this recipe create are very different -in a good way- when you consume them while they're warm and after they're chilled. The temperature(duh), the moisture, the texture... When they're warm, their insides are very moist and layered. (If you can tell from the picture above). After they're chilled, their texture is kinda like a mixture of New York cheesecake and Japanese cheesecake. And they just magically give your taste buds two very different feelings. (Kinda exaggerating here but its true). Seriously, YOU HAVE TO TRY THIS! 1. Preheat the oven to 180∘C. Bring the cream cheese to room temperature. 2. Put all the ingredients into a food processor and mix until no visible lumps. 3. Pour the mixture into cupcake tins to about 70% full. 4. Bake for 30-35 minutes or until a wooden skewer comes out the middle clean.